Slidely art will make your photos shine. 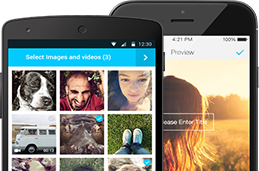 Turn your collage into a video slideshow or an animated photo gallery in 1-click! Get creative with awesome effects and fun stickers! Upload to YouTube, save to your device and share everywhere! Create, discover & share moment collections with Slidely's creative suite for web and mobile. Share your photos & videos with your favorite music in beautiful and creative ways.